This complex of 152 residential units looking out across the waters of Gooimeer consists of two associated projects. The first to be built ranges housing blocks along a lakeside boulevard. 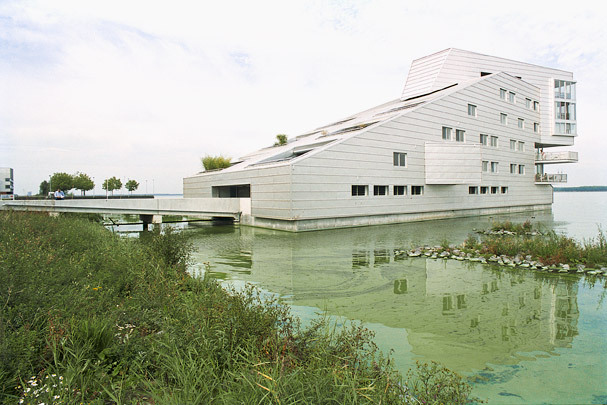 Its slate-clad exterior is dominated by the horizontal panorama windows giving a wide-screen prospect of the lake. The second sites five sculptural apartment buildings half on the boulevard, half in the water. For these aluminium-clad ‘sphinxes’ rising sharply towards the water, the view, once again, is of overriding importance. Terraces nestle in the sloping roof plane; the heads differ slightly in design.